Honeystone Candles reminds you that the Corvallis Indoor Winter Market runs for only two more Saturdays, April 2 and April 9. While several vendors participate in the summer market downtown, we have other commitments at the Eugene Saturday Market and some local spring fairs. Visit us this Saturday and next, at the Indoor Market. Tell us how your bees are doing and how your garden is growing! Take home some pure beeswax candles to add sweetness and light to your evenings. Stock up on our beeswax-based skin care. Honeystone pure beeswax candles: on the North wall along with Greengable Farms, Specially Made, and Crooked Furrow Farm. Honeystone returns to Market this week and looks forward to seeing you again. 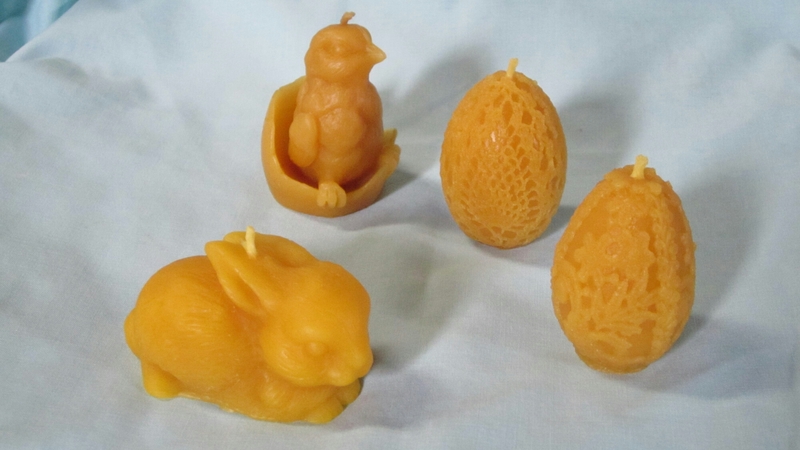 Check out our Easter candles, including elegant eggs, rabbits and hatching chicks. They are beautiful when they burn, but if you can’t bear to light them, we have a range of “utility” candles as well:- tapers, votives and an array of pillars. Add a little sweetness and light to your life with Honeystone pure beeswax candles! Honeystone Candles will not be at Market this Saturday. We are participating in a Pollinator Conference in Albany. We look forward to seeing your smiling faces again next week! Honeystone Candles will be back to share the sweetness and light of our pure beeswax candles this Saturday. We are celebrating our return by offering a free floating candle with your $10 purchase, February 27 only. Check us out and enjoy the fragrance of our pure beeswax candles. Honeystone Candles will return February 27th. Honeystone Candles will return on February 27the. Honeystone will return to market on February 27th. Honeystone Candles welcomes you to the final Indoor Market of the season. It has been a pleasure seeing your smiling faces each Saturday. Thank you for supporting the Corvallis Indoor Winter Market. Through summer, Honeystone will be at the Eugene Saturday market (www.eugenesaturdaymarket.org) most Saturdays unless we have other fairs scheduled. May 2: OSU Art Festival, 10am – 5pm. We are in space #68, facing the new Student Experience Centre entrance. May 3: Madison Avenue Garden Fair, 9am – 4pm. In the courtyard and surrounds of the Corvallis Art Centre, y Central Park. May 16: Garden Faire at the old Blodgett Cafe, 9am – 3pm. Burnt Woods Trail, Hwy 20, about 16 miles west of Corvallis towards Newport. This is a benefit for the East Lincoln Quick Response Team. Support their vital work and get some excellent bargains at the same time!